Facebook is one of those apps that most of us install right away when we get a new phone and continue to use it everyday. Most reports suggest that people all over the world use Facebook more than any app. But due to its poor optimization the app hog your phone out of its resources and deplete your battery and your memory. Not to mention the enormous volume of storage it occupies and the constant behind the screen activities are most of the time unnecessary. Also, most people still find the compulsion to install messenger app on their phone despite using other similar apps frustrating. This means these apps are making your phone to lose its power and potential and you think you cannot do anything about it. You cannot be more wrong because you can always uninstall the Facebook and make your phone to survive much longer than it used to. But since you are almost addicted to the app and you cannot live without it, you may hesitate to uninstall it. I have got a solution for you and I am not going to bore you by suggesting you to use your web browser to access Facebook like many people do. Instead, I introduce you to a rather awesome android app which you can use. And it’s a much, much more feature rich and much less memory and battery hogging alternative to the official Facebook app, known as Swipe for Facebook. Best of all you can also send messages with it! I am going to list below some of the awesome features of this app and give you a reason to uninstall the official app of Facebook and replace it with Swipe for Facebook. One of the most irritating thing about using both the web and the app versions of Facebook is the ads that are targeted towards us by tracking our activity online while we are logged into Facebook. Despite annoying, these ads also violate our privacy and sometimes we may find something completely irrelevant to us in our newsfeed which may be a sponsored or a promoted content. With Swipe for Facebook you never have to worry about these kind of sponsored ads displayed on your newsfeed anymore. It has an in built option to block these ads thus restricting your newsfeed only to the content you actually like. There are many wrappers for Facebook available out there and none of them seem to support sharing of images directly from the app. You may either share a link to the image or simply download the image and then open your gallery or any particular app to share it. This may be time consuming and irritating for people who constantly share funny memes and useful images to their friends. Even with the browser version of Facebook you cannot do this. But with Swipe, you can easily share your favorite images just like you used to do with the official app making it the process much simpler. Consider a situation where you find an interesting post or a funny picture on your newsfeed from a page and you want to check out other posts from the page. So you open the page and browse for a while and when you come back to your newsfeed there are a ton of new content loaded which makes it difficult for you to look for the content you were previously viewing. For this purpose, Swipe has a handy feature named floating previews. Once you enable it you never have to enter a new page to view a content and all you have to do is to long press on the name of the page and immediately a floating window of the page will appear. You can scroll through the content like you always do and once you are finished with the page you can simply swipe down to leave the page and continue scrolling through your newsfeed. Most of us tend to be more secured while using social networks and especially with apps like Facebook where most of our information are stored we think its a good idea to add an additional layer of security to the app by downloading an app lock app from the playstore and locking Facebook with it to prevent unwanted people from accessing it. But what if I tell you that you don’t need an additional app that constantly runs in the background to lock your Facebook app and instead you can do it with a feature that is built in? Yes with Swipe for Facebook you can also use the inbuilt security options to protect your app using password or your Fingerprint. With the launch of Nougat, Google also introduced a little trick known as homescreen shortcuts which can be used to perform frequent activities right from the homescreen by long pressing the corresponding app icon. This means that you never have to actually open the app to upload a picture or post a status and you can do it right from your home screen without opening the app making it much faster and easier. But since nougat has not yet rolled out to most devices and Facebook has still not implemented this feature to its official app you currently cannot do this in the official app. But that doesn’t mean that you may never be able to do it. With swipe you can now use the home screen shortcuts by long pressing the app icon on your homescreen and instantly perform your favorite activities like sharing a photo or updating your location. All you need is a custom launcher like Nova Or Action and you are good to go. The official Facebook app seems to be drunk most of the time. There is a prolonged issue that when you see a post on your newsfeed and it displays 10 comments but when you click and open it you may only see 2 comments and sometimes it displays nothing. This is highly frustrating and Facebook has not yet solved it. 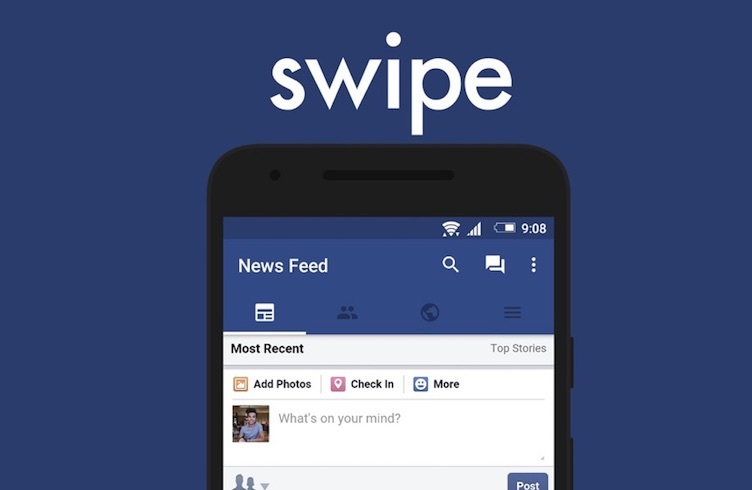 But you will not experience any such problems with Swipe and it has also removed many other similar bugs like force closing and not returning any search results that were pertaining in the official app of Facebook. It may be boring sometimes to constantly use Facebook app with that dull blue and white color combinations designed to cope with the color blindedness of the founder of Facebook. But you are perfectly fine and may expect a little colorful version of Facebook. For users like us, Swipe provides many different color combinations to use ranging from red, green and even a battery saving version of AMOLED theme and an automatic night theme switcher with a Material dark theme. If you do not like to play around much, you may even try the materialized version of Facebook and then tweak around the design layout by using the iOS and the Google+ versions. The last and the most important reason to switch to swipe from the official Facebook app may be to save their phones battery to make it last much longer and also to improve their performance of their phone. Even Though swipe for facebook is by default occupies very less space and consumes a negligible amount of your memory you can still squeeze it to give you much more battery life by turning on the battery saving option from the settings. You can also limit the notification sync interval and set up quite hours to completely optimize your experience with the app. It also provides notification toolbar and message toolbar to save you from opening the app every time you receive a message o r a notification. It even permits you to select text from posts! I think that these are enough reasons to convince you to switch from the official battery hog to a much efficient app and I promise you that you will find a significant change in your phones battery life and performance. Comment below your experience and share the post if you found it useful! Previous articleTransfrom Your Browsing Experience With These Google Chrome Tricks!